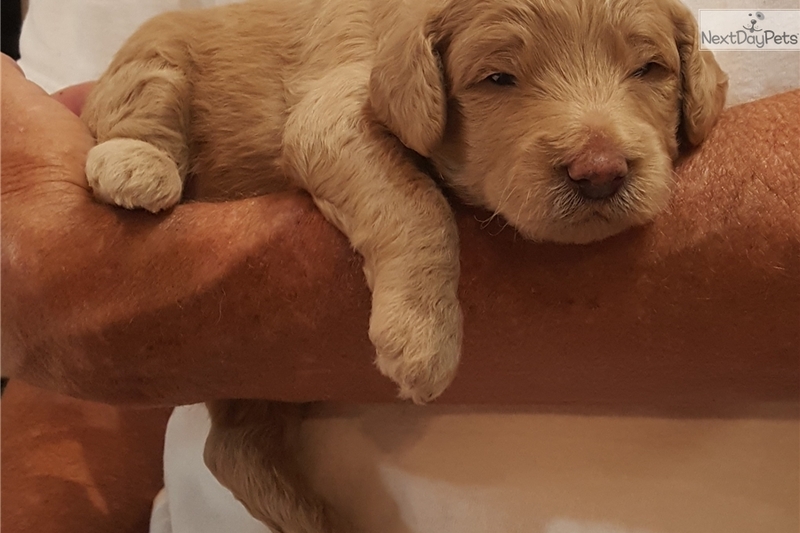 Beautiful mini Golden Doodles. 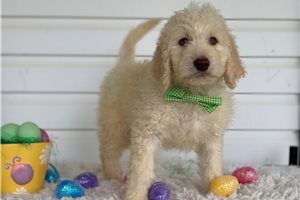 Mom is an English cream mini Golden Doodle weighing just under 30lbs and dad is a red mini Poodle weighing 14lbs. The puppies are F1b and will be approximately 20-25lbs full grown. There were 8 puppies in this litter, 5 girls and 3 boys. Their names are Peanut, Meatloaf, Dora, Flora, Marley, Francis, Spot and Gus Gus. Mom is my pet and dad is my brother-in-law’s dog. These puppies are hypo allergenic with minimal shedding, which is great for homes with allergies. All of the puppies were born and are being raised in my home with my two other dogs and my 3 year old son. All of the puppies have been socialized from birth and are very friendly. They were born July 22nd and will be able to go to their forever homes the week of September 16th. Each puppy will be current on vaccination, deworming and will be micro chipped. I also potty train and kennel train all the puppies. They all come with a health guarantee and a bag of food (and other supplies). I have had other litters with these parents and still stay in contact with puppies from prior litters. The image of the 3 dogs is actually from my last litter. The middle was my runt Penny and the red one on the left was my biggest Bengi. If you have any questions please feel free to contact me at (561)-306-3120 or email me. I will update the pictures as the puppy’s age.